One year of blogging and this article has been by far my most viewed post. As I celebrate the end of the year I thought it would be worth reposting my top blogs. Thanks for all your support. 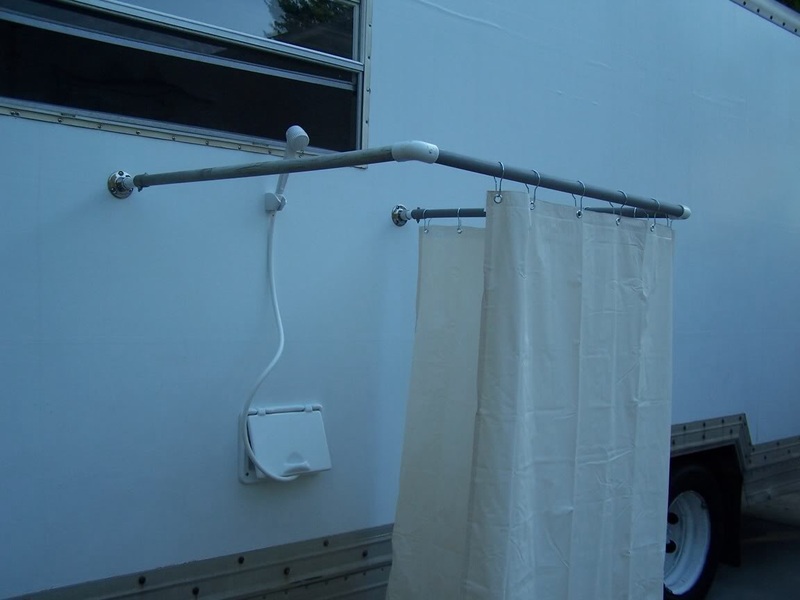 Several people mentioned they just purchased a portable outdoor shower stall, set it up next to their outdoor shower faucet and there you have it. There were a few comments explaining they had to add a longer hose to the shower head in order for it to reach. A few people suggested cutting a small opening in the shower stall wall to allow for the shower head to enter but most said they turned the shower stall door towards the trailer in order to access the facet and it worked great. These can be bought from any RV dealer for under $100 and it will save drilling into the RV or constructing your own. Here is an example from Cabela’s. 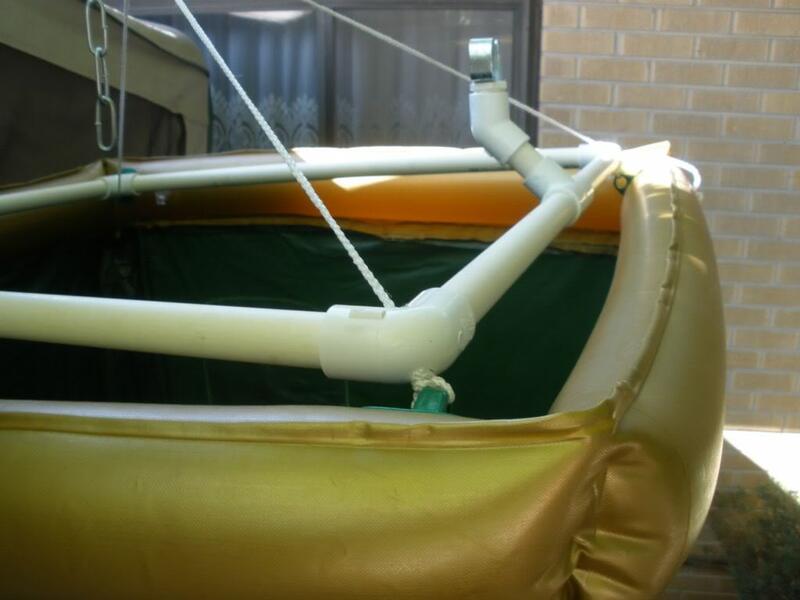 Buy 2 boat station mounts are screwed to the exterior wall, which allows pipe and shower curtain to be attached to it creating a quick and easy outdoor shower. 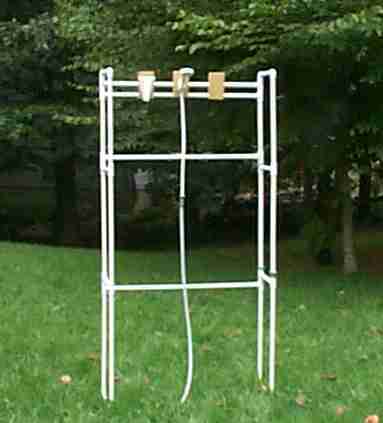 Build a shower stall out of PVC pipes that you can set up in front of the outdoor shower door. 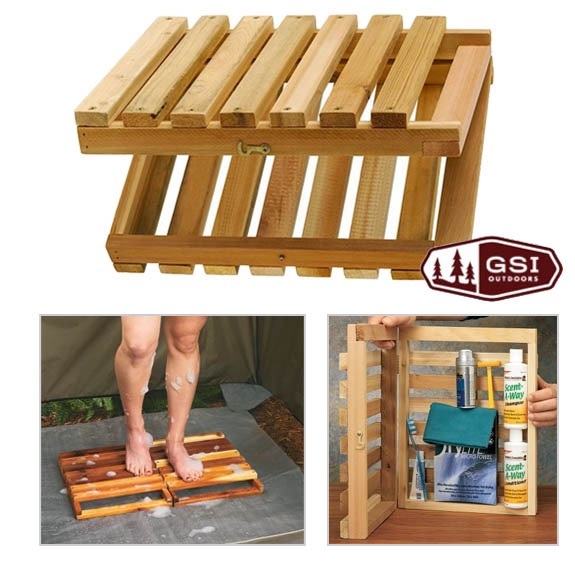 This DIY disassembles for easy storage. 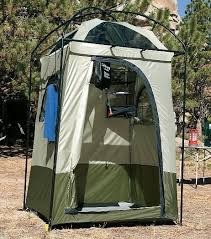 Hang an inflatable shower stall from to top of your RV. 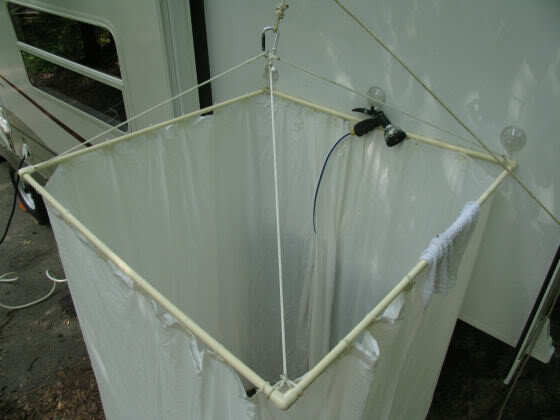 Make a hanging PVC pipe shower curtain rod to hand from the top of the RV. 1) A shower floor that keeps out out of the dirt. I covered this in an earlier post. 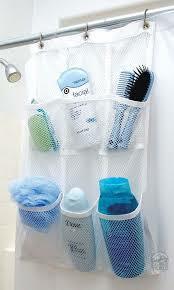 Handy shower caddy and floor cover. ← Chuckle Monday – Look who went shopping! Love this. We have a 1973 Minnie Winnie, and we are looking to make improvements in the coming couple of years. Thanks for this idea! My post about it is below. Glad that you found me, and I am happy to have found your blog as well. 🙂 Looking forward to reading more! Camping is the best way to chill out and go out and enjoy yourself. this will be a refreshing experience to enjoy camping in the natural climate. I have read your post. very nice. thank’s for sharing & tips of Outdoor Shower Stall. It’s a very informative post. Thank you, this is clearly something we RVers are looking for because it is one of my most searched posts. Most camp sites in the US won’t let you let grey water loose. That’s true but if you put a large container at the bottom to stand in you can dispose of the water the same way as you do your dish water. Works great! we converted a main floor closet with a window into a shower stall. We’d leave the window open from spring thru fall. The lilac bush was directly outside the window and provided natural air freshener. Next best thing to showering outside. Great post. A variety of camping and outdoors themed bath towels can be found all over the internet. Bed Bath & Beyond has sets of towels reminiscent of classic lodges, fishing and woodland scenes. 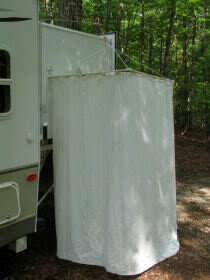 Hook these fun bath towels to the side of an RV with magnetic hooks or 3M Command Strips. We picked up an antifatigue mat at a home improvement store to use as a floor for a shower stall. We can use the mat outside the camper to help keep dirt out of the camper when not used for the shower. The mat hass holes in it to allow water to drain away.